How To Decorate Your Home For Christmas Time In Seconds? With 7ProductGroup Gnome Ornaments Of Course! ... poorly made Christmas home décor? ... decorating your home with the same ornaments over and over again? Nodding, right? Well prepare yourself because you have just found the ultimate Christmas home décor ornaments. Skyrocket the looks of your home without having to spend a small fortune. These mini yet cute gnomes are here to save the day and facilitate Christmas decoration to the fullest. Spread The Holiday Spirit All Over Your House! Thanks to their excellent handmade craftsmanship, wonderful colors and multipurpose role, these mini gnome figurines shouldn't be missing from your Christmas décor. Their ergonomic size, compact shape and lightweight nature, make them easily portable. Place them anywhere you want. In the living room, over the fireplace, on the kitchen countertop, on your study desk, maybe in your bookcase, on the dining table, use as coffee table centrepiece, in vases, hang them from the Christmas tree, or have them standing on your nightstand. The fixed wire inside their hats makes every hat crazy tall for endless whimsical playfulness, and long lasting laughs. Still Not Sure If This Gnome Figurine Ornament Set Is The Right One For You? · Brilliant Christmas gift idea for your dear friends and beloved ones. · Handmade with high quality materials and lots of love. 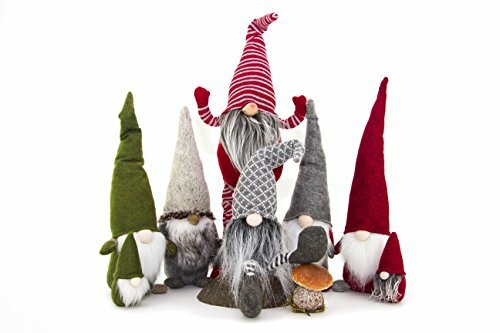 · Traditional Nordic gnomes for unique home décor. · Weighted bottoms. Make these gnomes sturdy and solid. ✓ PREMIUM QUALITY & CRAFTSMANSHIP MEET: All of our Nordic gnome ornaments are handmade from scratch and with lots of love. The body and hat are crafted from green/red soft felt and the nose is made with real wool. Their long white/grey beard is made of fiber fur. They all stand tall and their sturdy bottom will prevent them from tipping over. ✓ MAKE THE MOST THOUGHTFUL CHRISTMAS GIFT: In search for the coolest yet unique Christmas gift? If so, then you should end your search here with our mini Nordic ornaments. Gnome figurines also known as Tomte or Nisse make the most thoughtful Christmas gift ever. Perfect for men, women, teens, kids, co-workers, family and friends. ✓ CHOOSE THE FIGURINE SET & COLORS YOU WANT: Designed to accommodate even your most demanding needs our gnome figurine ornaments come in many shapes, sizes and colors. Choose the figurines or set you like the most or simply get them all. Start your own gnome figurine collection today with authentic 7ProductGroup gnome ornaments! INCLUDED: 3 - 16 inch Gnomes(grey,green,red) , Luxury Gnome, Tall Red 18 inch, 2 MINI Gnomes(red and green), GreySitting Gnome 10 inch and BONUS Children's Book about OUR GNOMES! (paperback) ✓ COMPLIMENT ANY AREA AROUND THE HOUSE: The time has come for you to decorate your home with only the best of the best Christmas ornaments. Our gnome figurines shouldn't be missing from your home décor. Enhance your home's style, compliment any area both indoors and outdoors and make all your guests wonder! ✓ GET THESE GNOME PLUSH DOLLS WITH CONFIDENCE: Since your satisfaction is our top priority, these Christmas ornaments are backed by our unconditional money back guarantee policy. Just in case you happen to have any issues with them. Ideal for the living room, bedroom, near the Christmas tree or the window, in the garden, or even your office. If you have any questions about this product by Holiday Christmas Gifts 7ProductGroup, contact us by completing and submitting the form below. If you are looking for a specif part number, please include it with your message.